Where She Went by Gayle Forman. Dutton Books, 2011. Review copy from publisher. The Plot: Sequel to If I Stay. So, um, spoilers for If I Stay. Three years ago, Adam's girlfriend, Mia, was in a terrible accident. And now? It's been years since they've seen each other. Mia left for college, and moved on with her life. Adam eventually did the same. Now, they are both successes, he a rock star with an actress girlfriend while Mia is a rising cellist. They haven't spoken to each other in years. And then they meet. Almost strangers. The Good: If I Stay was told from Mia's point of view, in a place between life and death, as she struggled with the question of whether or not to stay with the living, despite the tremendous loss of her family in a car accident. I loved If I Stay: I cried, cried about how perfect and flawed Mia's family was, cried at the decision she had to make, cried at her choice to go on, alone. I picked up Where She Went expecting it to pick up Mia's story and to find out about what happened when she woke up. Where She Went was not what I thought it would be, but instead was what I needed it to be. Grief. And living with loss. And rebuilding. And those things, those are terrible, horrible, the world has ended moments. Just because Mia chose to go on, didn't mean that she woke up and was the same person. It didn't mean that it was somehow easy to know how to navigate having no mother, no father, no brother. And just because Adam and Mia were everything to each other, it didn't mean that they were, at that moment, the best thing for each other. So Mia walked away from Adam, because her grief and loss were hers. And if I had to place a bet onto why this is three years later, and why it's not by Mia, my bet would be that what Mia went through was too raw and awful and confusing. Where She Went is a punch in the stomach, and had it not been told when and how it was, it would have been even more overwhelming. Instead of being hard to read, it would have been impossible to read. With Where She Went being Adam's story, the reader can also see and experience and appreciate Adam's own loss. No, it's not the same as Mia's, but it is a loss. He loved her family, he loved Mia, and then he was left without that and without knowing who he was without her. Sometimes people are meant to be together, but that does not mean they are meant to be together always. Or forever. And I'm glad that not only does Where She Went explore that, but it also gives two people a second chance. They needed to be apart. But can they come together, again? In many ways, I liked this book better than If I Stay. So, yes, a Favorite Book Read in 2014. 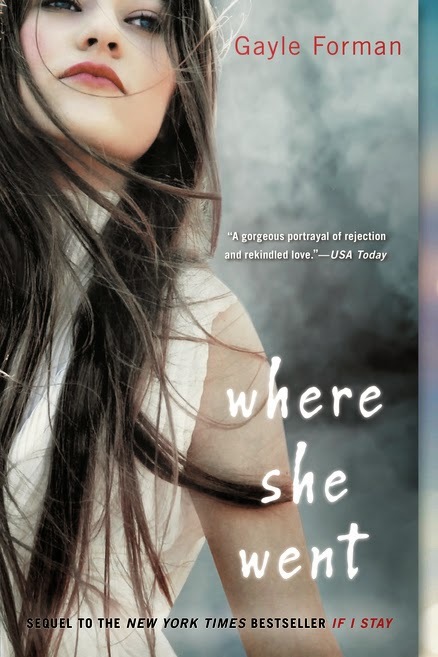 >>Where She Went was not what I thought it would be, but instead was what I needed it to be. I think this is the most excellent compliment you can give to a book sequel. Often I'll go into a sequel with really clear ideas of what I want from it, but that's a foolish way to read. It's much better to be open to the story the author is going to tell -- after all, if they weren't to some degree enjoyable, I wouldn't have picked up a second book by them, right? Wow. That sounds really powerful!